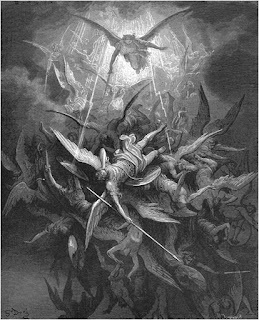 When people talk about spiritual warfare they often think of battles between angels and demons and how things like prayer can affect that conflict. But as I mentioned in the last post, an overly spiritualized view of this conflict misses how demons have, throughout the Bible, been intimately connected to nation states. But an overly spiritualized reading of this text misses the origins of this story. This isn't the first time in the Bible we see Michael battling with demonic forces associated with Babylon. As I've described before on the blog and in Reviving Old Scratch, we see Michael tangling with demons in a story from the book of Daniel. As we follow the demonic trail through the Bible we see a development here. Specifically, the national "sons of God" we observed in the last post are shifting away, here in Daniel 10, from being national gods to demonic spirits. But these demonic spirits, I want to point out, are still connected with nation states. In Daniel 10 it's the kingdom of Babylon. And when it comes to Michael's war in heaven in the book of Revelation, Babylon is also featured as the political manifestation of dark spiritual powers, the Dragon and the Beast. All that to keep bringing us back to the point. There is more to "spiritual warfare" than disembodied spirits--angels and demons--fighting in some unseen supernatural realm. There is a concrete political aspect to this struggle as well. And yet, to swing to the other side, the struggle isn't merely political, it's spiritual as well. Behind Babylon in Daniel 10 is a spiritual "prince." And in Revelation it's the Dragon. And to think that you can effect political change in Babylon without wrestling with the Dragon seems both quaint and naive. This is the connection--how the demonic is a fusing of the spiritual and the political, the biblical association between idolatry and oppression--that we are tracing through the Bible.